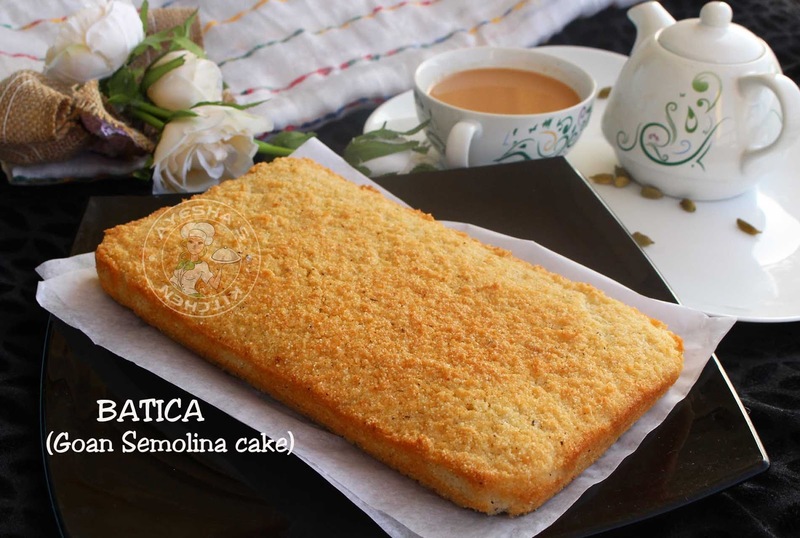 Waiting for simple and easy yet outstanding cake recipe for Christmas? 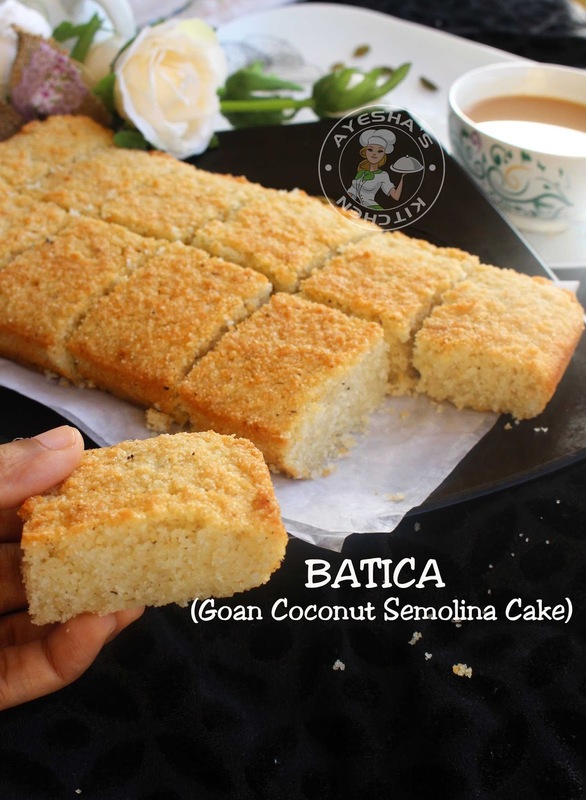 Then here is the recipe for a semolina COCONUT cake without flour(All purpose flour/ maida).This cake is also known as Bolo De Rulao (cream of wheat cake) which is commonly made during Christmas in every Goan households. 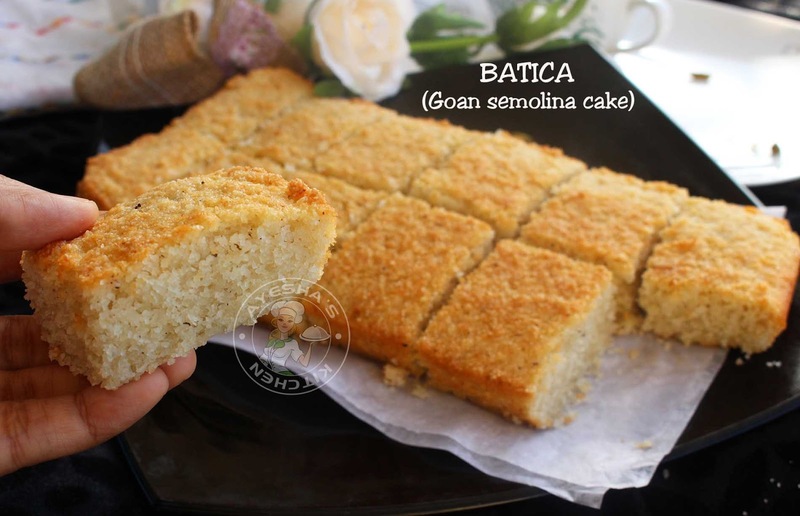 This cake (Batica )has a dry texture like cornbread. The batter of this cake must set aside overnight or for 10 hours at room temperature which makes this cake soft. Really this is a scrumptious cake. I highly recommend giving this cake a try. Line the baking tray with butter paper and set aside ready. Crush the freshly scraped coconut by pulsing it in a blender for a second or two (like crumbs). Add this crushed coconut to a bowl along with fine semolina, baking powder, and salt. Combine it well with a spoon (the mixture should resemble breadcrumbs). Set aside. Now in a large bowl, add eggs(must be at room temperature). To this add sugar and beat until white and fluffy. Then add vegetable oil and whisk again well. Now you can add cardamom powder (i skip this, but still it tastes perfect). Now pour this egg mixture little by little into the semolina mixture. Fold it very well using a spoon or spatula. Now transfer it to the prepared baking tray and cover it with a foil paper. Keep it at room temperature overnight (10 hours) or at least 6 hours. Remove from oven and let it cool to room temperature before demolding. Then take out the semolina cake off the butter paper and slice. Really it is a scrumptious cake. Must try this at least once in a lifetime. Please SUBSCRIBE my Youtube channel - Ayeshas kitchen.